The city is a paradoxical space, in theory belonging to everyone, in practice inaccessible to people who cannot afford the high price of urban real estate. Why should access to public and social goods be tied to the ability to acquire private property? When people lose access to the urban commons, they are dispossessed of something to which they have a rightful claim. What kind of right is the right to the city? Political theory has much to say about individual rights, equality, and redistribution, but has largely ignored the city. In order to fill this lacuna, this book draws on a largely forgotten political theory called solidarism. Solidarism’s justification of social rights is particularly relevant to conflicts about urban space. 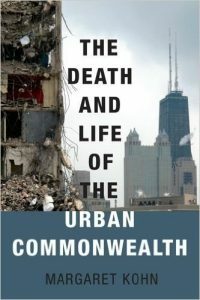 The book uses solidarism to interpret the city as a form of common-wealth, a concentration of value created by past generations and current residents. This approach helps us rethink struggles over gentrification, public housing, transit, and public space.